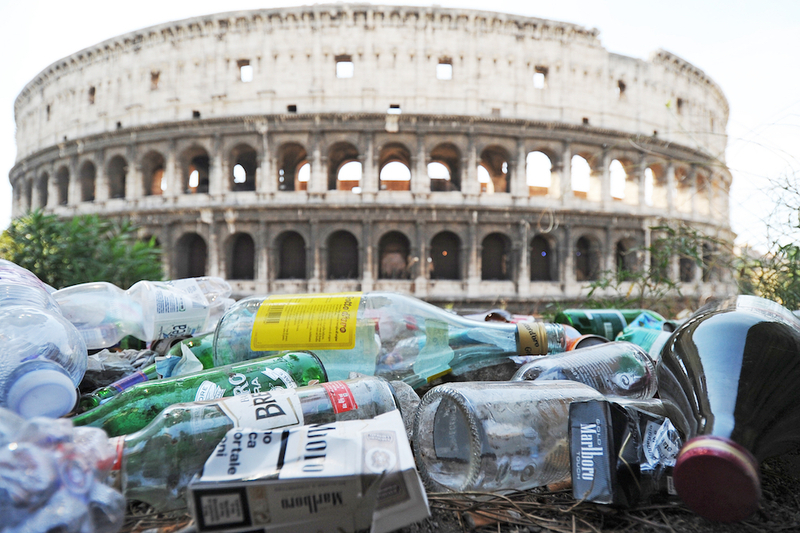 Uncollected garbage near the Colosseum in Rome. Courtesy of Shutterstock. It’s true that Rome, which has never been an easy place to make a living, is struggling these days. The economy is stagnant, I’ve never seen so many homeless people and beggars on the streets, and many Romans look visibly frustrated. It’s no wonder that populist parties are riding high. I am aware of no other great city whose past has been so well-recorded for so long. We have some idea—and often a very good idea—of what Rome was like, and what happened there, during each of the last 25 centuries. Nor, in any other great city, has so much survived physically from its past, through buildings and objects. If you know where to look, you can find souvenirs of the events that shaped Rome, allowing firsthand connections with great moments hundreds or thousands of years past. I can give a few examples. In a modern hall at the back of Capitoline Museum are what look like weathered stone walls. One has been excavated, and you can see it descending deep into the ground. These are the foundations of classical Rome’s most important temple, to Jupiter Best and Greatest, which dominated Rome’s skyline for a thousand years. Created 2,500 years ago by the last of Rome’s early kings, Tarquin the Proud, the temple was partly responsible for his being the last king. Romans became so aggravated by the building costs that they rebelled and took power. Look at these piles of stone and you are looking at the moment the Roman Republic was born. Another temple built five centuries later—the Ara Pacis, or Temple to Peace—is in a much better state, having been painstakingly reassembled in the 1930s from scores of fragments. By the time it was built, Rome ruled the Mediterranean world, and the republic was dead. On the side of the temple, you can see a relief depicting—in their best and most fashionable togas—Rome’s ruler Augustus, his sidekick Marcellus, and their families and helpers walking in procession. It is a portrait of a new elite: the people who dismantled the Republic. In its place rose an unstable military dictatorship, whose administrations would often be decided by civil war. If you visit the Museum of Rome near Termini station, you can capture the panic and anger during one especially important such regime change. A decade ago, during excavations of the emperors’ Palatine Palace, a scepter and two imperial standards were found. They had been carefully wrapped in silk and placed in wooden boxes. Dating work showed they had belonged to Emperor Maxentius, who at the Battle of the Milvian Bridge just north of Rome, was defeated by Rome’s first Christian emperor, Constantine. Looking at these objects, one can imagine the desperate moment when pagan Maxentius’s courtiers, learning that their emperor was vanquished and dead, hid his regalia of power to spite his successor. Rome has preserved its own defeats. In the city’s ancient Aurelian wall you can see the Asinarian Gate with its tall round towers. There, on a December night in A.D. 546, soldiers defending the city shimmied down a rope to search out the commander of their enemies, the Ostrogoth Totila, to ask how much he would pay for them to open the doors (he paid enough). Across the city, you can see the raised walkway leading from the Vatican to Castel Sant’Angelo, where, in early May 1527, Pope Clement VII ran for his life as Spanish and Lutheran German soldiers below took pot shots at him, and their comrades turned Rome into a slaughterhouse. And you can see the Papal Walls on the Gianicolo Hill, where in June 1849 Garibaldi’s soldiers heroically defended Rome in a hopeless struggle against a much superior French army. Though Garibaldi lost the battle, he won the war right there, as his forces’ courage gained sympathy around the world. Within a few years his dream of a united Italy, free of foreign rulers, was reality. Or you can see the Balcony of the Palazzo Venezia, where, on the 10th of June 1940, Mussolini announced that Italy was at war with Britain and France (the crowd below was so unenthusiastic that a patriotic newsreel of the event had to be dubbed with cheers from sports events). And you can see the Museum of the Liberation of Rome, which was used as a torture center by the SS during Rome’s Nazi occupation. Now preserved as a warning from the past, you can read desperate messages scratched into the walls by those held there. For all this history, today’s Romans still aren’t impressed. “What use are monuments?” is a comment I have heard more than once. “Monuments are what’s dead and gone.” I disagree. I don’t believe that history repeats itself, as every age is different—but I do believe it can offer useful clues about human behavior. Romans have lived under every kind of political system, from oligarchy to theocracy, and from dictatorship and monarchy to democracy. Frequently they have lived under more than one at the same time. One can see Rome’s past as a vast case study of humankind and politics. If you know where to look, you can find souvenirs of the events that shaped Rome, allowing firsthand connections with great moments hundreds or thousands of years past. What can be learned from spending time among these relics? For one thing, they tell of the frightening chanciness of events. We like to think that great changes happen for important reasons—that they’re all but inevitable—but it’s rarely so. Huge and enduring transformations can come from the equivalent of a throw of a coin. If Maxentius had defeated Constantine at the Battle of the Milvian Bridge and had hung on to his imperial scepter, Christianity might never have dominated Europe as it did, and instead might have remained one religion among many. If Mussolini had not been tempted into war in June 1940 his dictatorship might have endured, ever more sluggish and corrupt, for another decade or two. And if river fog had not risen from the Tiber early in the morning of the 6th of May 1527, hiding the Holy Roman Emperor Charles V’s starving soldiers from Rome’s guns, Charles’s army would never have broken into Rome, the city would not have had to endure a horrific 10-month occupation, and Italy might not have been dominated by Spain for the next two centuries. Rome’s monuments also hold warnings. However infuriating democratic government can be, beware of chucking it away. Once you start down the path to dictatorship you never know who you might get. Rome has been ruled by a paranoid schizophrenic (Caligula), a talentless wannabe singer (Nero), and murderers far too numerous to list—including some popes. For all their claims to efficiency, dictators rarely govern well. Mussolini despised the elected rulers who preceded him and yet, for all their faults, their rule was far more effective and less corrupt than his. Under democracy, Italy thrived economically and was well prepared for war. Under Fascism the economy stagnated and the country’s military was in a hopeless state. Another warning that seems especially relevant these days is that democracy’s worst enemy is inequality. At the heart of Rome’s first Republic was a patriotic alliance between rich and poorer Romans. When the greed of the rich transformed Rome into a slave economy and the poor lost their role in society, they also lost a sense of connection with the Republic, and it died. But Rome’s monuments have some good news for us, too. Somehow, out of all of these wars and tyrannies and destruction there has emerged an extraordinary, fascinating, and beautiful city. The most important thing about Rome is that it endures. There is nowhere else on earth I would rather be. Matthew Kneale is a novelist and nonfiction author. His books include Rome: A History in Seven Sackings and English Passengers, among other titles.